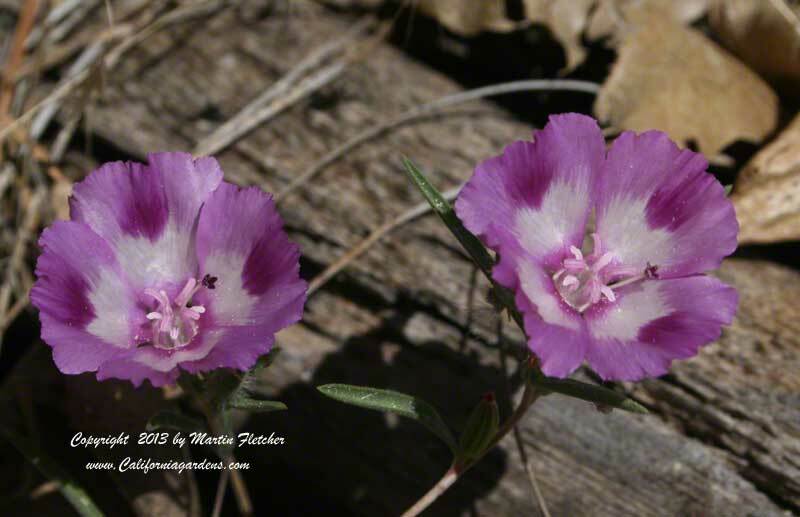 Clarkia williamsonii grows in the Sierra Foothills and up into the pine forest. The Fort Miller Clarkia is not very tolerant of heavy clay soils or Summer irrigation. The colorful 1" flowers of Clarkia williamsonii are produced in the late Spring and early Summer. This photograph was taken near Hetch Hetchy Valley in Yosemite National Park. The Clarkia genus is pretty dependable from seed. Wildflower seed is best spread in the Fall with just before the first substantial rain. Always a guessing game, but I try to time this in Mid-October when a good storm is forecast. Flowers and foliage of Clarkia williamsonii Fort Miller Clarkia. High resolution photos are part of our garden image collection.